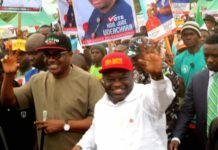 A group known as Abia Youth Team (AYT), has faulted the recent judgment of the Appeal Court, which declared the All Progressives Grand Alliance (APGA) candidate, Mr. Alex Otti, the winner of Abia State governorship election. The President, AYT, Prince Obinna Ehumadu, who stated this during a protest in Lagos, asked the Supreme Court to set aside the December 31, 2015, ruling of the Appeal Court, which nullified the election of Okezie Ikpeazu citing inconsistency in the votes cast in three Local Government Areas of Osisioma, Obingwa and Isi-Alangwa. According to him, “We are here because of equity and justice. 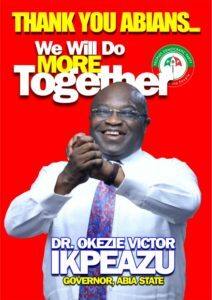 We are here to make our voices known to Abians and Nigerians that the votes of the good people of Abia State must count. The rights of the people must be respected because we are in a democratic system of governance. 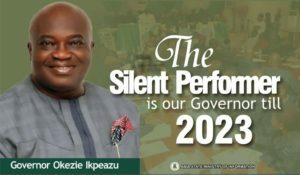 “We are showing solidarity with our Governor Okezie Ikpeazu, to tell whole world that he is already a performer. This is a governor that has unveiled seven roads and awarded several contracts within seven months. 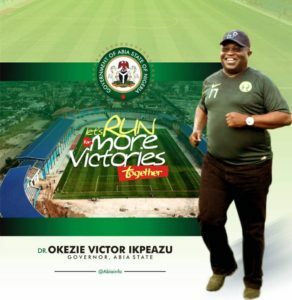 He has the zeal to transform Abia State into the Dubai of Africa. 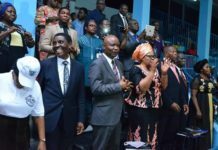 “If you look at the very filthy Aba, which was in the media radar for years as one of the dirtiest cities in Nigeria, it’s already wearing a new look. For us to get to the promise land in Abia State, Governor Ikpeazu doesn’t need any distraction. During the last election, Abians from across the federation traveled back home for voters’ registration. 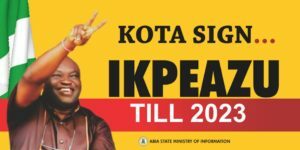 “We also traveled home en masse to vote for the Peoples Democratic Party (PDP) candidate, Okezie Ikpeazu, in the April 11, 2015 governorship elections, so why then should Ikpeazu be sacked by the Appellate Court sitting in Owerri? “For us, that judgment is inconsistent with the tenets of democracy and the will of the Abia people. 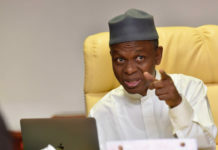 We seize this medium to call on the wise Justices of the Supreme Court to critically look at the matters again, and do the needful, which is upturning the verdict of the lower court,” he added. 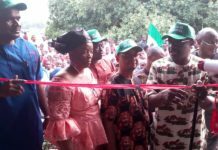 The voices of the people of Abia State, the group said, must not be truncated for the interest of peace and to safeguard its democracy from hawks. 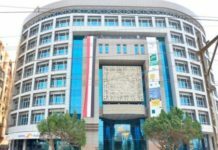 Similarly, Facilitator, AYT, Okechukwu Nzekwe, said: “ We believe in all fairness that the wise men at the Supreme Court will restore the mandates Abians gave to Dr. Okezie Ikpeazu. The votes of people in these three council areas must count. As stakeholders in Abia State, we would not want any Abian to be disenfranchised. “We have just commenced a journey into democracy, so we want the rule of law to prevail. Abians have spoken and that mandate stays. 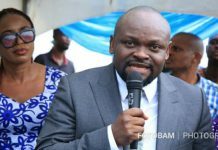 If at all the Appellate Court was not satisfied with the votes cast in these three council areas, the best thing it would have done in line with fairness, reason and logic was to ask for a re-run, rather than sacking the Dr. Okezie Ikpeazu. It happened in Rivers and Akwa-Ibom. 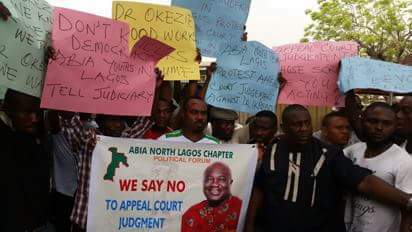 This inconsistent ruling is what we are appealing to the wise Justices at the Supreme Court to look into, and I can assure that we at Abia Youth Team (AYT), are very optimistic that Governor Okezie Ikpeazu will be victorious at the Supreme Court,” he said. Your Ikpeazu did not win Abia State governorship election. I will advice you read the appeal court judgment before embarking on street protest. Is not only in Abia state that election verdict was entered against the incumbent governor so why is Abia different that Dr Ikpeazu and PDP spin doctors should be renting street protest. This is hight of desperation on the part of Ikpeazu and Abia PDP.